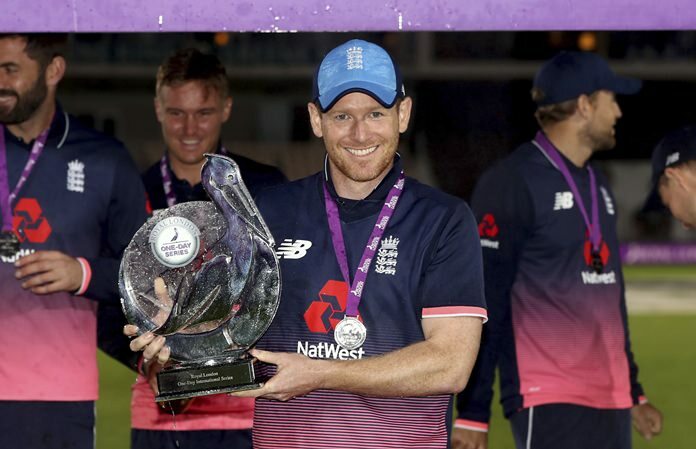 Southampton, England (AP) — Jonny Bairstow top scored with 141 not out as England chased down their target of 289 in 38 overs to win the fifth and final one-day international against West Indies on Friday. England finished on 294-1 after Joe Root smashed a six off Marlon Samuels to win the series 4-0 with the second ODI a no-result due to rain. Bairstow, who also got a ton in the first match, hit 17 boundaries in his 114-ball innings. Bairstow’s innings was the highest ODI score by an England batsman against West Indies. Jason Roy was the only English wicket to fall — trapped leg before wicket for 96 by Miguel Cummins in the 22nd over — after an opening stand with Bairstow of 156. Root was 46 not out in 44 balls at Southampton with two fours and the winning six. Earlier, Shai Hope struck 72 and Ashley Nurse added a late-innings 31 not out off 12 balls to help West Indies score 288-6 after England won the toss. Chris Gayle hit five sixes — including four in a row across two overs — in a 29-ball 40 at the top of the innings to get the tourists off to a quick start. Hope’s knock was more measured, coming off 95 balls and including four fours and a six. All eight of West Indies’ batsmen got into double figures as they looked to avoid a series whitewash. Jake Ball was smashed for 94 off his 10 overs, with spinners Adil Rashid (1-42) and Moeen Ali (1-36) the most economical of the England bowlers.